AirVPN is not the most well-known VPN in the VPN industry. That is a fact. What hasn’t been established as of now is whether it deserves its place among the elites of the VPN industry. For starters, AirVPN is an Italy-based VPN service and takes great pride in the fact that it was begun by a bunch of loyal and dedicated groups of hacktivists and activists. In other words, it gives a lot of worth to user privacy. The other features which distinguish AirVPN from standard VPN service providers right off the bat are its commitment to strong encryption and security measures. It also boasts some of the most robust privacy features not seen in the VPN industry for a long time. It offers VPN over SSL and through Tor which is mightily unique. Moreover, our research indicates that AirVPN is also one of the fastest, if not the fastest outright, and the most stable of all VPN services available in the market. So why isn’t it our top pick and why is it being held back by the likes of IPVanish, StrongVPN or ExpressVPN? If you read a bit more about AirVPN you will quickly see a pattern. A lot of users initially sign up for AirVPN, but most of those new users don’t bother to renew their package with AirVPN. That seems very strange. On the face of it, it might look like most people “like” to use AirVPN but do not like signing up for its packages. There is no one way to explain the situation. You’ll have to read the full review to make up your mind. Right now, you can sign up for AirVPN for a mere $8 per month if you sign up for a single month. There are also the usual special discounts available for users who commit to the service for a longer period. For example, AirVPN only charges you $5 per month if you sign up for a year. There is also a three-day trial which is available for free but you’ll have to request it to AirVPN staff. If you don’t want to contact them then you can sign up for a three-day package for just €1. Unlike many other VPN services AirVPN does not distinguish between its different packages. In other words, all packages come with the same features. If you play your cards right, AirVPN can become the cheapest VPN available to you in the market. To make it easier for potential customers to sign up for the service, AirVPN accepts payments made through mediums such as PayPal and many other payment processor services. You should have no problems in making an international payment to AirVPN. If privacy is a bigger concern for you than most, then you can pay AirVPN via Bitcoin as well. Use whichever method best suits your needs. AirVPN has systems in place which ensure your anonymity. If you pay AirVPN through Bitcoins, the company would not know your identity or real IP address. AirVPN allows new users to connect up to 3 simultaneous devices per subscription packages, so if you have a personal computer and a smartphone and a tablet too, then you’re all set with a single AirVPN subscription package. AirVPN makes use of a clever little technique known as double-hops which allows it to easily bypass censorship. To put it another way, it is one of the few VPN services that has the ability to run on streaming websites such as iPlayer and Netflix. This technique is sometimes also called DNS routing. So if you are in a region that isn’t the United States or the United Kingdom, you can still access websites such as BBC iPlayer and Hulu. Just connect to the internet via AirVPN and select your desired server which would allow you to access these streaming websites and you’re done. AirVPN will take care of the rest. As indicated earlier as well, AirVPN also offers VPN through Tor. Perhaps the only other service that offers VPN through Tor is BolehVPN and this gives AirVPN an advantage over a lot of its competitors. VPN through Tor is a simple concept. Basically, your computer is first connected to the internet through the Tor network and then to AirVPN. The main advantage of using VPN through Tor is excellent anonymity. The level of autonomy we are talking about here cannot be offered by just a VPN service. In fact, we believe that the best way to protect your privacy and hide your identity is to combine the overall benefits of Tor and VPN. AirVPN does that by default. Moreover, the company also offers simple to follow guides for users to connect to the Tor browser and then connect to the VPN service itself. As far as ports are concerned, AirVPN is pretty thorough in this department as well. Remember that VPN services can also be blocked. In places such as China and Iran, VPN’s get blocked all the time. AirVPN proves itself to be one step ahead of the curve by providing users a VPN service that runs perfectly fine using OpenVPN protocol over TCP port 443. This is exactly the same port that is used by standard SSL traffic and hence your online traffic is safe and secure. The main advantage of making your OpenVPN traffic resemble regular SSL traffic is that it makes it rather difficult for spying agencies and governments to block the service and break the internet (for some). There are all sort of options for users to change their port settings. We have already talked about TCP port 334, but AirVPN also offers a whole variety of ports to get rid of censorship anywhere in the world. Chances are you’re not amongst the most wanted criminal (like Snowden?) in the world. Because then you would have actors coming after you that have the capability of using very sophisticated and complex deep packet inspection to search and then discover that some VPN protocols are being utilized. Places such as China are notorious for doing this to their internet users. But even if you have these kinds of entities coming after you, AirVPN tries to protect you with a double wrap encryption. Let’s explain that for a bit. AirVPN wraps its OpenVPN encrypted online user data with another layer of encryption which is usually SSL or SSH. This makes it extremely hard for anyone to detect the use of a VPN service. The NSA is known to have the capability of decrypting SSH, so to be on the safe side you should always go with SSL. SSL and SSH tunneling is a technique that is strong enough to hold off attempts from the likes of Great Firewall of China and other spying agencies. But since this method uses an additional layer of encryption, it might cause your internet speed to decrease significantly. There is also the option of using remote port forwarding if you want to. It is available for users who want to use the service and there are up to 20 open ports for incoming connections. So if you are one of those folks who host websites and/or game servers, then AirVPN has got your back. The company is based in Italy but offers servers in more than 15 countries. The majority of those countries are in Europe but there are servers available in regions such as the US, Hong Kong, and Canada. AirVPN can’t match the number of servers when put up against the best VPN service providers in the business but nevertheless, the server selection is reasonable. As of this moment in time, AirVPN only offers its VPN service through the OpenVPN protocol, which isn’t a bad option. The likes of PPTP and L2TP/IPsec have not been able to keep pace with hackers around the world and hence should be regarded as insecure for most average users. As far as commercial use is concerned, OpenVPN is the most secure one. Moreover, OpenVPN is compatible with almost all platforms. The only platforms that aren’t supported as Blackberry and Windows mobile. But really how many of us, now, really use those? We’ve already discussed the fact that AirVPN uses extremely tight encryption. To further ensure the privacy of its users, the company has a policy of keeping no logs. It uses shared IP addresses and hence no one really knows which IP address belong to which user. AirVPN is also amongst the very few VPN service providers who actually implement standards such as Perfect Forward Secrecy which enables OpenVPN to be as secure as it is. 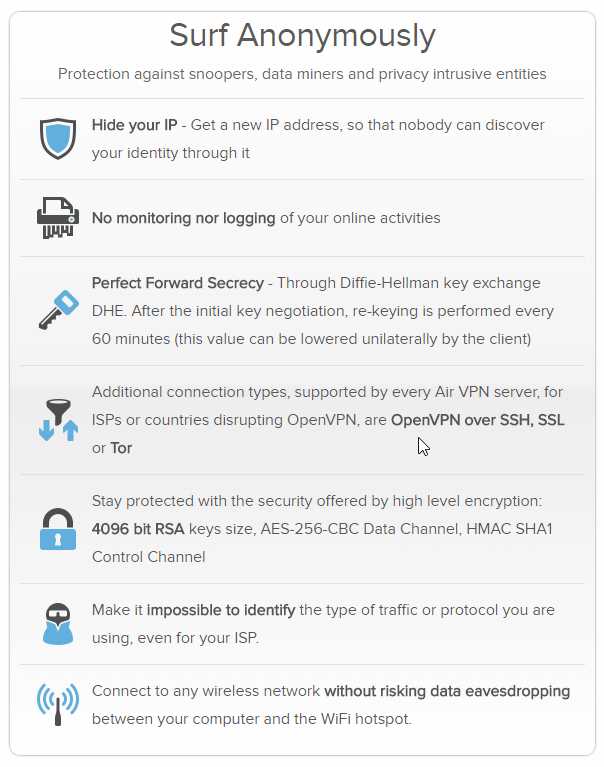 AirVPN makes use of 4096-bit Diffie-Hellman keys and most of all, these are refreshed every hour. That makes AirVPN almost immune to Logjam attacks. These Logjam attacks were recently exposed by researchers and hence are pretty lethal except against AirVPN. Many other VPN services got affected by a new vulnerability by the name of port fail, but AirVPN manages to keep itself safe from that as well through practices such as the use of separate entry and exit IP address for each of its VPN servers. One of the other distinguishing features of AirVPN is that it protects its users with WebRTC protection as well. This essentially makes AirVPN users safe against DNS leaks. If that wasn’t enough already then AirVPN also offers a kill switch which can be utilized through the options menu from its desktop client. AirVPN is one of the safest, most secure and most private VPN services out there and it manages to achieve that status through the use of advanced but optional VPN technologies such as VPN through Tor and accepting payments through cryptocurrencies. The only problem with offering so many services and features in one VPN service is that AirVPN doesn’t have much time to explain its purpose and its technologies to the common folk in a language that is understandable or even enticing. Most of the instructions on how to set up the service are too terse and filled with jargon and hence may put off users who are using a VPN service for the first time. AirVPN’s documentation isn’t easy for new users either and that may be one of the reasons why new users are not signing up for AirVPN. The other problem with AirVPN is that since the company is based in Italy, it is a member of the Fourteen Eyes spying alliance and hence in case of a problem, the company will have to cooperate with the likes of NSA and GCHQ. This is not good for anyone who values his/her privacy. Not to mention that Italy is known to be pretty tough on criminals who are involved in piracy. With that said, it has to be mentioned that even before the famous EU Data Retention Direction announced to be void by the respected European Court of Justice based on human rights and other stuff, VPN service providers who operated from Italy were not, legally, required by law to keep logs on their customers. According to official sources, AirVPN assures its potential customers and if such a scenario arises, where it is requested by any other EU country to cooperate with it, then the company will bring the case to European Court of Justice. And perhaps that confidence is the reason why it allows users to engage in P2P activity on all of its VPN servers. The primary form of customer support is offered via forums. These forums aren’t your average ghost forums. There is definitely a lot of helpful information present in AirVPN forums. Again, the main problem with using these forums would be the amount of technical know-how one would need to have in order to benefit from the information. New users are unlikely to use these in order to solve anything because they are pretty intimidating. Again, on the plus side, such technical discussion in forums means that there is a lot of valuable information available for those who have a deep understanding of VPN services and how they inherently work. It also gives us an insight into how much AirVPN staff is invested in these forums and hence are willing to share very intricate workings and details of their VPN service operations with the public. This is certainly rare in the VPN industry where most of the hired staff doesn’t have a clue about VPN services and their problems let alone an expert knowledge of how VPNs work, as is the case with AirVPN forums. You can post questions on the forums to get help. You can also email AirVPN through a ticketing system. Don’t expect an instant answer, though. Before we move onto specific about the client AirVPN offers to its users let’s first talk about the first interface. Yes, the interface people are going to see even before signup up. That is the official website. The website, is ugly, to say the least. But it is functional. Moreover, the language used on the site is laden with jargon and advanced terminology which is unlikely to be understood by most users. You would have to be one hell of an encryption junkie to understand most of the stuff that is put up by AirVPN staff on the official website. This is not a nice experience for new users and you can read some of the comments on various forums online about how it bother new users from signing up for AirVPN. The upside to this jargon-heavy and functional presentation style is that you can view a lot of information about servers from the official website. You can view statistics related to load, current number of users along with ping times and routing. However, signing up for the VPN service is pretty easy. The official website only asks new users for their email address to sign up for the service and even encourage new users to make use of disposable email addresses in order to sign up to further protect their privacy and identity. 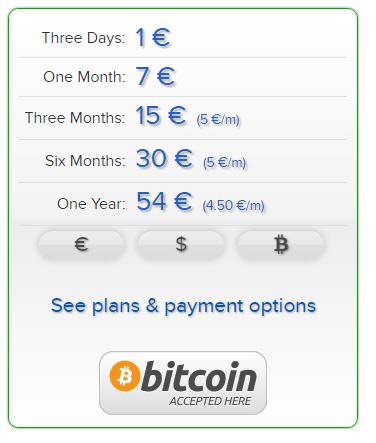 As mentioned before, the website makes it comfortable for new users to pay through unconventional means such as Bitcoin. You can pay through Bitcoins using CoinBase or CoinPayments. Once you have made the payment,s you should be able to receive a welcome email which will include some beneficial links. AirVPN makes a lot of effort to protect customer’s privacy even before they download and run their software application. For example, in the welcome email, AirVPN does not send you any account details via text. Users are required to come up with their login name and password during the initial sign up process. Just to make it sound cool, AirVPN calls its dedicated and custom desktop client by the name of Eddie. It is also available for other operating systems such as Mac OS X Mavericks and Yosemite along with Linux. The first thing you should know about AirVPN Eddie is that it is essentially an open source software application. You can perform an independent audit on it if you wanted to. More VPN service providers need to follow AirVPN’s example and introduce open source software to their ecosystem. The desktop version of AirVPN’s VPN service client, Eddie, comes built-in with features such as DNS leak protection, plenty of stats to select the ideal server and dynamic server selection feature. Through the settings menu, you can view real-time logs and these, in turn, enable you to keep a close eye on what Eddie is doing at any given moment. It is entirely another matter if you understand these logs. From the main interface, it should be clear to anyone that the lock icon located in the top-right corner of the screen is an indication if the Network Lock is enabled. When it is enabled, it produces a firewall that blocks incoming and outgoing traffic that isn’t protected via AirVPN’s VPN servers. As we have mentioned multiple times before, AirVPN is one of the few VPN services that offer DNS leak protection even when the Network Lock is disabled. Therefore, the Network Lock basically ensures that DNS leaks become extinct as far as your internet traffic is concerned. There is also a killswitch if you’re into that type of thing. The simple default setup is enough to block IP leaks through the new vulnerability called WebRTC bug. Make sure the Network Lock firewall is not conflicting with your operating system’s firewall. There is no way to properly route IPv6 requests. But Eddie does help you by disabling IPv6 which basically prevents any DNS leaks. The only major problem with Eddie is that it automatically alters Windows DNS settings. Usually changing DNS settings is a good feature because it basically makes sure that all DNS requests are only resolved by AirVPN’s VPN servers. But consider the possibility if the client shuts down unexpectedly and quickly. You will need to manually revert the Windows DNS settings again before you can use the internet. AirVPN’s Eddie VPN client has all the features you could ever want from a VPN client but the problem remains that it is highly technical in nature and usage terms which are likely to be foreign even to some of the most experienced VPN users. We’ve already discussed that AirVPN has a Windows custom desktop client so there is no need to discuss that further here. Apart from the Windows client, AirVPN also offers instructions for setting up its VPN service on Android (which uses OpenVPN on Android. You can also use OpenVPN Client for Android and OpenVPN Connect to set up the whole thing) and iOS. For, the iOS, you will need to make sue of OpenVPN Connect. AirVPN also supports DD-WRT devices and Tomato routers. The Android app is able to quickly connect to the VPN service whenever the user moves from a secured router/mobile data to unsecured Wifi connections. It also protects against DNS leaks to the fullest. It also has a kill switch. So hurry on that. One thing should be clear to you by now. AirVPN has some of the best features in any given VPN service and that alone are its strengths. Many users will not be able to cope with the technical jargon and that has proven itself to be AirVPN’s downfall till now. That doesn’t mean that AirVPN is not dedicated to its craft. The company has paid more than attention to things like privacy, new features, and other technical stuff to make it an impressive VPN service. The real deal-breaker is its presentation. It’s tech-heavy focus. Of course, the only thing you need to do to run AirVPN is to download its client and then run it but again, since other VPN services have made extra efforts to make it easy for the common user to understand anything and everything about VPN, AirVPN has to do the same in order to be competitive. If you closely observe the content of the discussion forums and AirVPN’s official documentation, you would not be able to help yourself to think that the options presented in those mediums would definitely intimidate existing users as well as new ones. AirVPN is a VPN service that is, at this time it seems, aimed at technology cokeheads and people who spend their entire lives learning the ins and outs of VPNs and stuff. To make it more mainstream, AirVPN is going to have to do some serious work on its overall presentation and the nature of its content. AirVPN has a lot of promise but it has to make its service more accessible to people who only want encryption and not a degree in encryption. Been using Airvpn for a few years now and can honestly say it is the best vpn service out there. Yes for newbies it can be a it daunting BUT there is a wealth of info available in the forums and advice is readily given so it is pretty easy to setup and use for newcomers. We are glad you had a nice experience with AirVPN. Let’s hope they continue on this path.